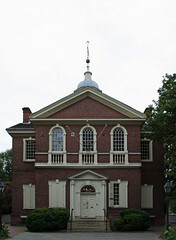 Carpenters' Hall, built in the 1770s and home to the First Continental Congress. For a better view of the magnificence of this Georgian building, just click directly on the photo to enlarge it. Carpenters' Hall was constructed in the 1770s, and is one of the most important attractions within Independence National Historical Park. Don't be fooled by the name of Carpenters' Hall. It sounds, initially, as if the building is a modern trade-union shop or factory. Nothing could be further from the truth. Instead, Carpenters' Hall is a magnificent 18th-century building with Georgian architecture, that witnessed a key event in American independence - the First Continental Congress - as well as serving as the home of important Philadelphia cultural institutions. Over the years, it has been home to the American Philosophical Society and the Second Bank of the United States as well. As the summer of 1774 wound to a close, delegates from all over Britain's North American colonies began to arrive in Philadelphia for a novel venture, the First Continental Congress. Naturally, the Second Continental Congress is far better known, due to the fact that it ultimately adopted the Declaration of Independence on July 4, 1776. However, the First Continental Congress is of enormous historical significance, as it paved the way for the Declaration of Independence, almost two years later. During its seven weeks of meetings, this gathering would be the first time that many of the Founders met each other in person, and began to form connections. On September 5, 1774, the proceedings finally got under way; ultimately, there would be 57 delegates from 12 colonies, with only Georgia - the most geographically distant - going unrepresented. Admission is free, and unlike Independence Hall, no timed tickets are required. As is always the case with places to visit in Philadelphia, located in the historic district, we would strong recommend the purple Phlash Trolley, if you have the good fortune to be visiting Philadelphia between May 1 and October 31, when it operates. Also, SEPTA offers a variety of options to arrive there. Carpenters' Hall is located at 320 Chestnut Street - Chestnut Street between 3rd and 4th Streets in Old City Philadelphia. You can take the SEPTA Blue Line / Market-Frankford Line / the "el" - which are just different names for the same transit line - to its stops at either 5th Street or 2nd Street - it doesn't really matter. It'll be just a couple of blocks each way. However, if you are traveling into Philadelphia from a distant neighborhood, or from its many suburbs, SEPTA Regional Rail would likely be your best option. The vast majority of SEPTA Regional Rail trains will stop at Market East Station - which is located at 11th and Market Streets. From Market East, you can connect to the Blue Line, without even needing to go outside. You'll have to buy tokens at the SEPTA ticket window, but just ask the cashier to direct you to the Market/Frankford Line. Follow the signs marked with white letters on a blue background, until you reach the 11th Street Blue Line station. Make sure that you board on the platform reading "Eastbound to Frankford", and ride either to 5th Street or 2nd Street, and disembark there, and walk the couple of blocks. You can also just walk from Market East, down to 320 Chestnut, as it's about eight or nine blocks or so. You can also take any SEPTA eastbound bus along Market Street, when you ascend from Market East station (although you'll need tokens for those, too.) Cross over to the south side of Market, where traffic is going eastbound, toward the Delaware River. When you get on the bus, just ask the driver, "are you going to Independence Hall?" If so, hop on, get off at Independence Hall, and you'll easily be able to ask someone to show you Carpenters' Hall. 1724 - More than a half-century before the Declaration of Independence, the Carpenters' Company is formed as a trade guild in Philadelphia. With its full title being the Carpenters' Company of the City and County of Philadelphia, it is the oldest trade guild in America. It should be noted that "carpenters", in the 18th century, was a much broader term than in the 21st century. In the colonial period, "carpenters" encompassed not just skilled woodworkers, but builders and architects, also. The bastion of carpentry in America was Philadelphia, where the Carpenters' Company, a guild of master craftsmen, controlled the profession by setting prices and standards. The Carpenters' Company was never more than a minority of those practicing the carpenter's trade in Philadelphia, but its influence was far greater than its numbers... [it] was a tightly meshed professional caste with considerable authority over all building in the city. The medieval guild tradition of sons following their father's trade, intermarriage among the families of tradesmen, and an apprenticeship system that demanded loyalty to the craft combined to create a prosperous class of artisans with social status and political power. Moreover, members of the Carpenters' Company were invariably master builders who acted as general contractors and therefore exercised control over all of the other building trades in the city. Source: Jack McLaughlin, Jefferson and Monticello: The Biography of a Builder, p.86. February 3, 1768 - The Carpenters' Company purchases property on Chestnut Street. 1770 - The Carpenters' Company begins construction on Carpenters' Hall. The Company has continuously owned and operated the building from 1770 to the present day, in fact. 1773 - Carpenters' Hall completed. September 6, 1773 - The Library Company of Philadelphia - founded by Benjamin Franklin in 1731, moves into the second floor of Carpenters' Hall, until the end of 1791. When the First Continental Congress arrived in late summer of 1774, the Library was offered to them, rendering it the first true Library of Congress. Delegate John Adams of Massachusetts cites the library as an asset, in his letter detailing why Carpenters' Hall was selected to host Congress. June 20, 1774 - The Committee of Correspondence of Philadelphia and Pennsylvania meets in Carpenters' Hall, in order to organize efforts and call for a Continental Congress, in response to the acts of Parliament known as the Coercive Acts / Intolerable Acts. July 15, 1774 - The nine counties of Pennsylvania send delegates to Carpenters' Hall, to begin work on resolutions urging all colonies to appoint delegates to the Continental Congress. July 21, 1774 - The Pennsylvania county delegates adjourn official business, but continue meetings. October 3, 1774 - Francis Draymon, who had been hired by Franklin as the Librarian, as well as to teach Franklin French, opens a French Academy in the second-floor Library. March 16, 1775 - A Committee on American manufacturing meets in the Hall to discuss the boycotts imposed by the Continental Congress. December 18-27, 1775 - Over a nine-day span, there are three nights in Carpenters' Hall, when top-secret diplomatic intrigue takes place between Franklin, John Jay, Draymon, Franklin's French librarian; and an unofficial French agent, Julien-Alexandre Achard de Bonvouloir. Franklin and Jay are hoping to obtain French support for the American colonies, prior to making a formal Declaration of Independence. 1770-1777 - The Carpenters' Company meets regularly in the building, throughout the construction, until the British capture Philadelphia in September 1777. January 18, 1779 - With the British having evacuated Philadelphia in June 1778, the Company once again meets in the Hall. December 30, 1791 - After nearly two decades of tenancy, the Library Company of Philadelphia moves out, due to its growing size. Monday, September 5, 1774 - Although the delegates from 12 separate colonies, had all assembled in Philadelphia, it was still not certain as to which building in Philadelphia, would host the First Continental Congress. Accordingly, the delegates first gathered - in typical 18th-century custom - at City Tavern Philadelphia, located at 2nd and Walnut Streets. (We'd highly recommend that you visit it; you can see the meticulously reconstructed replica, with complete historical authenticity. Your meal, and the ambience which accompanies it, is the closest thing possible to experiencing the Founders' own firsthand experience in Philadelphia. 5. Monday. At ten the delegates all met at the City Tavern, and walked to the Carpenters' Hall, where they took a view of the room, and of the chamber where is an excellent library; there is also a long entry where gentlemen may walk, and a convenient chamber opposite to the library. The general cry was, that this was a good room, and the question was put, whether we were satisfied with this room? and it passed in the affirmative. A very few were from the negative, and they were chiefly from Pennsylvania and New York. Source: The Two Hundredth Anniversary of the First Continental Congress, 1774-1974. 93rd U.S. Congress, Government Printing Office, 1974. If you'd like to leave Carpenters' Hall and return to Independence National Historical Park, please click here.